The early settlers of Paris no doubt thought that they had secured for themselves a safe environment in which to found their city. the first fortifications around the Ile de la Cite and later to the north and south of the Seine may have been sufficient through to the end of the medieval period but come the era of gunpowder and heavy artillery and the presence of continental enemies to the north and east, particularly Germany, the natural advantages of the site became insignificant compared to the technological resources required to defend the city. While Paris is protected by the loops of the Seine to the west, high ground overlooking the Bievre to the south, the line of the Marne to the south east and heights around the Forest of Montmorency to the north, natural defences to the north east are sparse and this unfortunately is the direction from which most of the city's post medieval assailants arrived. In 1670 Louis XIV had demolished the existing walls and Paris remained an open city until the perceived threat from Germany lead to a series of commissions in the 1830s. A plan of 1833 made a number of suggestions based primarily on the idea of fortifying the Farmers General Wall, this had been a notional work designated primarily for tax purposes and creating, and creating a partial ring of detached works. 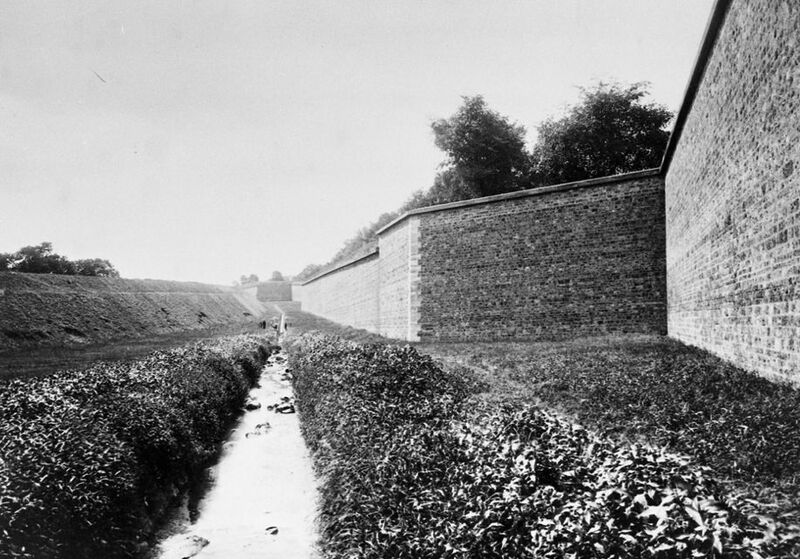 By 1845 work on the inner Thiers Wall and most of the peripheral forts was complete. In 1870 the Franco-Prussian War broke out leading to a four month siege of the city. Following the 1871 Treaty of Versailles the German army withdrew and three years later France embarked on a huge programme of fortress building inspired by the doctrines of Sere de Rivieres. This included nearly 200 forts in strategic locations around the country several of them in the vicinity of the capital constituting the so called 'second ring' forts largely in place by 1890. 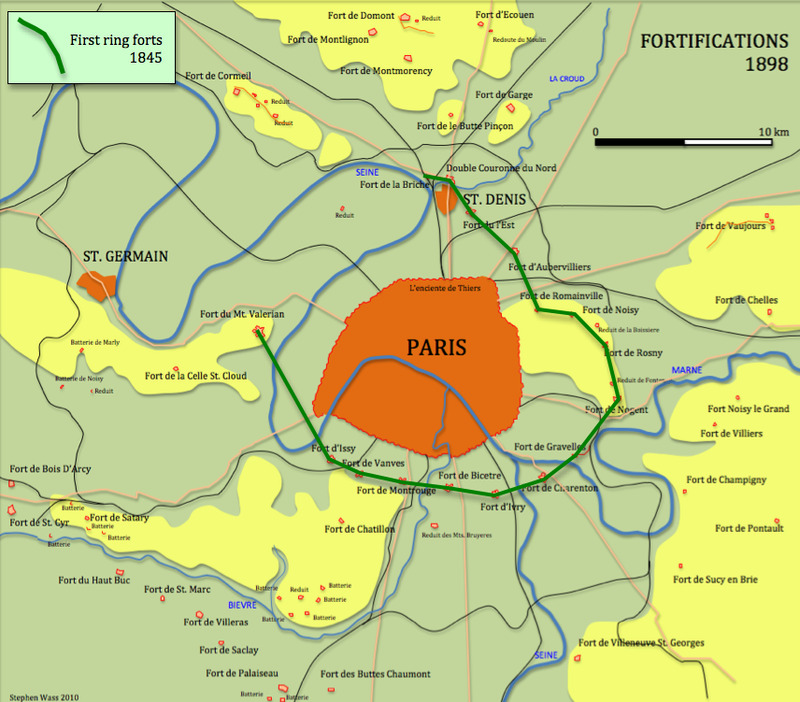 Whilst the popular image was of Paris being surrounded by two concentric rings of forts the actual layout reflected closely the strategic and tactical opportunities of the local topography. 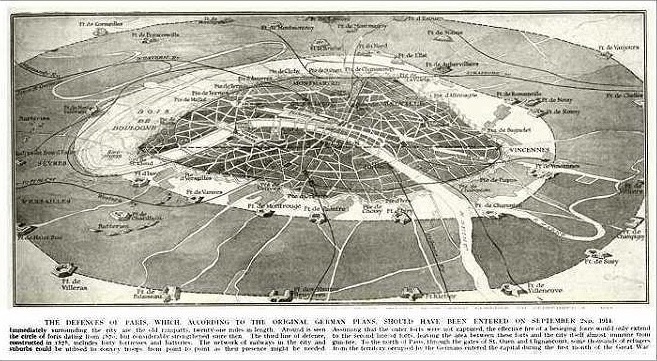 Early twentieth century interpretation of the defences of Paris as a 'double ring'. DISCLAIMER: I am fortunate in being able to travel to the Paris region and especially the town of Ermont, fairly regularly and having spent some time examining the Victorian defences of Plymouth my attention was drawn to the fortifications around Paris, especially those north of the city and specifically the works on the Cormeil Heights which with their combination of larger forts, associated batteries and military way should make for an interesting comparative study. In order to understand the larger picture I have begun by mapping and identifying from the air (sorry Google and Bing) the main sites. Hopefully over the next few years I'll be able to visit these sites on the ground and start to explore the kind of lesser works which made Plymouth so fascinating. As ever I struggle along largely in the dark so any comments, queries or suggestions are always gratefully received and generally acted on. Many of the sites discussed are in some form of public ownership but few are formally open. Readers must not assume that places mentioned in the text are available for public access, I will try to give some indication for each monument what the access issues are. Once again I apologise to those whose displays cannot handle the wide screen format, the big picture marches on.